Once upon a time, cupcakes seemed like a novel idea for a wedding...until they got done to death. While a cupcake tower may no longer seem like such a daring alternative to a wedding cake, the fact remains that everyone still loves cupcakes. Check out these fresh new ideas for how to make mini wedding cupcakes feel creative and unique again. A big trend in baking right now is for flavors aimed at sophisticated palettes. These are not the super-sugary confections served at a child's birthday party. With upscale ingredients like chocolate ganache, Mexican vanilla, and espresso, these are cupcakes designed to please adult taste buds. Try offering an array of intriguing flavors for your wedding cupcakes, such as dulce du leche, eggnog, and pumpkin spice. For your more adventurous guests, you might even include some cupcakes with a spicy kick, like chipotle-chocolate-cinnamon. Top with a cream cheese frosting to cool off the smoky kick of the chipotle. 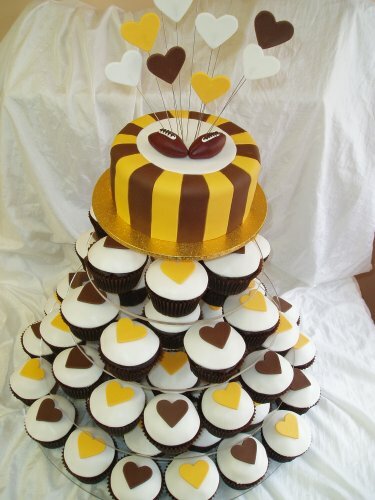 Another way to set your cupcakes apart is to display them in a unique fashion. There are some delightfully whimsical ideas for cupcake scenarios; choose one that suits the overall style of your reception. 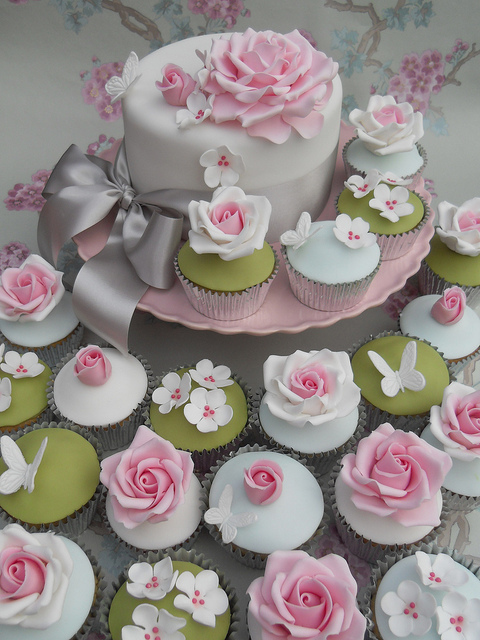 For instance, if you are a bride who leans towards pink, a feminine wedding gown, and pretty pearl bridal jewelry, you might adore the cupcakes that are made to look like flowers. In this fun design, the little cakes are frosted to look like flower blossoms, and then "planted" into real clay pots in clusters. It can even double as a centerpiece for the wedding reception. This would also be an adorable idea for a bridal shower dessert. Cupcakes can also be fashioned into humorous arrangements. How about frosting the tops of cupcakes to look like pool balls and displaying them in a chocolate "rack"? That would be such a fun idea for the couple who likes pool; it is also a great alternative to a groom's cake. A neat variation on this would be to make the cakes resemble tennis balls or golf balls - whatever you and your fiance are into. It would be a great way to add a surprise touch to a traditional country club wedding, the kind where the bride wears an understated gown with her mom's pearl bridal jewelry. Use the sports theme cupcakes either in lieu of a tiered wedding cake or for fantastic wedding favors. 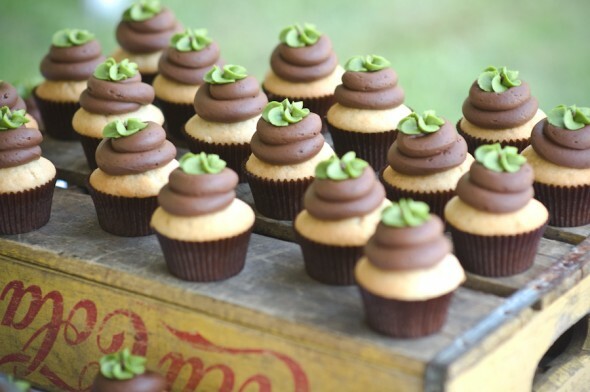 There are plenty more ways to give your mini wedding cupcakes a fresh new look. Dress them up with unique laser cut wrappers, frost them in eclectic colors, or personalize how you display them. The popularity of cupcakes has turned them into a new wedding classic; it is up to you to put your personal stamp on them so they are as fun to look at as they are to eat.